I’m still getting caught up with these affiliate marketing income reports. I hope to be all caught up by the end of May though, so please bare with me here. I don’t want to post these reports back-to-back as I personally find that a bit boring, so I plan to continue to post them every 2nd post until I’m all caught up. This report marks the last month in 2013, so it’ll be interesting to see how I ended the year when the beginning was so great. As with my last couple of reports, since this report is long overdue, my memory is going to fail on the particulars of what went on with my campaigns, so I won’t be able to go into too much detail in this post apart from the numbers (which are 100% accurate). Absolutely insane. I did 14x that revenue back in June… but ugh… I have to stop living in the past. This is the new reality. BOOM! Don’t be hating on me just because I bring in the big bucks. $10 a day folks – I’m living it big! That works out to a 3% ROI too, BTW. 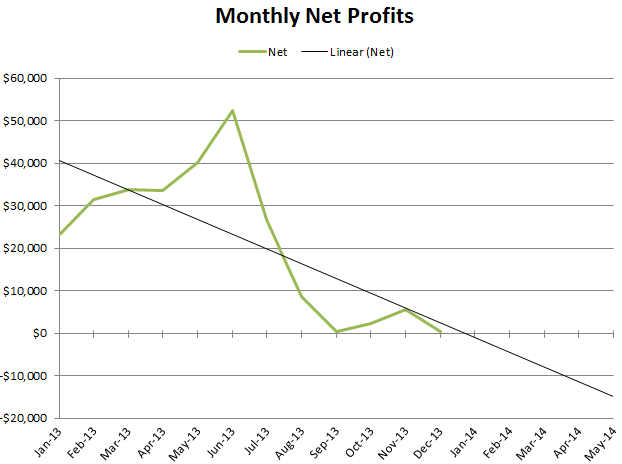 First, despite the last 4 months having less-than-stellar results, I still managed to pull a profit each and every month of the year. Secondly, it shows how having a few really good months completely offsets the fact of having a few really poor months. I think this is mainly because you are still in control of what you’re doing. If something isn’t working, you can always just shut it off and try something new… you’re not going to lose your shirt if you can’t afford to. The only way you lose money in affiliate marketing is by trying out new stuff to look for the next profitable campaign, so you’re always in control of how much you can lose. Lastly, I didn’t end up grossing a million dollars like I was hoping, due to the poor performance of the last third of the year. But I’m still very pleased and proud of the end results: $258,859.68 profit for the year (from my campaigns), averaging out to $21,571.64 a month. 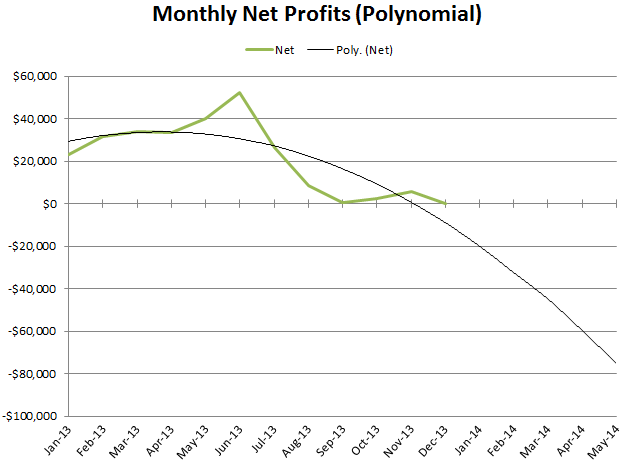 This graph is really starting to get skewed, and I think it’s because I started off at around $22,000 net profit in January 2013, which acts as the baseline. The high variance in my campaigns really messes up any mathematical formula predictors. Hopefully they become more accurate as more points of data are entered. While a bit less hectic than November, December was still a very busy month for me, mainly due to house stuff. I turned off most of my campaigns, only leaving a few here and there, as can be seen with the low revenue that was generated. I basically did nothing affiliate-marketing wise in December. So in a way, I’m really not disappointed in the month, because I put no effort into my campaigns during that time. Normally in this section I list the plans I have for the upcoming month as well as predict how I think the month will fare profit-wise. However, since January has already come and gone, I will be skipping this section in this report, since I already know how it went. I expect to publish it in about 7-8 days from now (after another post), so stay tuned. So i need to invest ! I know the down months are disappointing, but you’ve probably learned more seeing both the highs and lows in the long run. Hope 2014 is treating you well. Well, highs and lows are part and parcel of the field. Some months will bring with it huge profits and some will not be that exciting, profit wise. In worst cases, the money spent in the form of expenses won’t return back in the form of profits, racking up a huge loss. But fortunately that is not the case here. Quite an investment Tyler! We spend money and time to make money though. Give up man hours or dough, or a likely combo, to bring in profits. I’m making more through gifting and freelancing these days, but any channel rocks if you’re willing to put in time and effort working these streams. Love your honesty Tyler. Keep on sharing and inspiring people to live our internet lifestyle. Chilling in Thailand now, there’s no other way to live life the way I see it. Wow, that’s a lot man. First of all, congratulations. I noticed that you also spent large amount of money. May I know the breakdown? That seems a LOT. Even if you use dedicated server, it won’t take so much money. Your earning of this month is very disappointing. I think you need to switch to a new technique. Your previous earning was great. Hope you will make money like previous time again. That is lot of money, happy for your success. I wish to follow your path. Congratulations for what you have done, best wishes for your earning in 2014. Nice presentation. It way very easy for me to grasp everything from it because of the graphs and tables. As a beginner in online business, your income report was an inspiration to me. Keep sharing this. 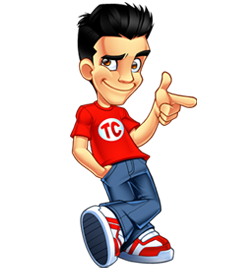 First i congrates to you for your affiliate marketing earning. Your previous earning was great. Don’t worry next time you do well. Thanks for sharing reports ,i wish you recover soon from loss. All the best.